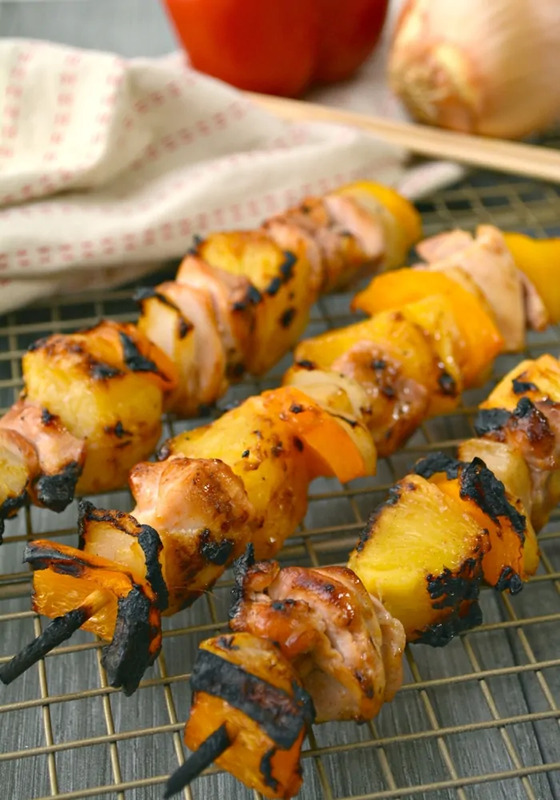 Grilled pineapple chicken skewers with a sweet and tangy Polynesian glaze are a perfect for an easy family dinner option or for serving at your next BBQ. Are you looking for something new to throw on the grill this summer? 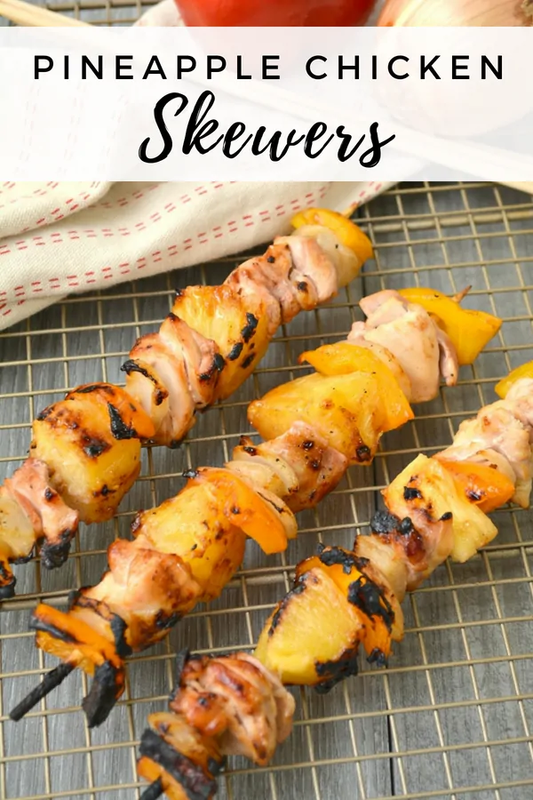 This easy chicken and pineapple skewer recipe is sure to quickly become a favorite with your family. Chances are you’ve made chicken on the grill before. Or maybe even chicken skewers. But, what sets these skewers apart from all the rest is the amazing Polynesian sauce used as a glaze to coat the skewers as they cook on the grill. The delicious Polynesian sauce is the perfect combination of sweet and tangy, and pairs well with the chicken and veggies. Does your grill need an upgrade? Check out these tips for selecting the best grill for summer barbeques. Pair your chicken skewers with a side of basmati rice and you’ve got a delicious summer dinner. This grilled chicken skewer recipe is also a great way to shake up your next cookout. People are always expecting a BBQ menu to consist of those two basic options: burgers and hotdogs. 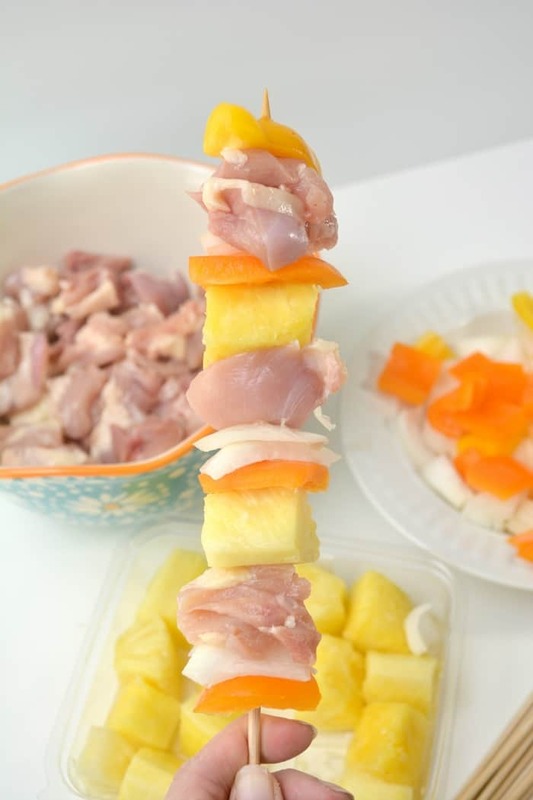 These pineapple chicken skewers will be a pleasant surprise on your cookout menu that everyone is certain to love. Planning a barbecue? Be sure to check out these tips for planning a backyard party. These chicken skewers are seriously so easy to make. Simply add all the ingredients for the Polynesian sauce in a pot and heat it up until it thickens. Bam! Your glaze is done. Now, chop your veggies and chicken, then thread them onto the skewers. Pop those bad boys on the grill. Brush on that amazing Polynesian glaze. 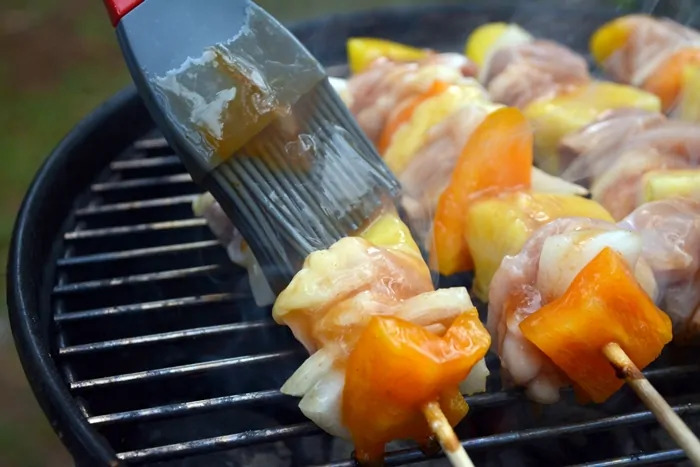 Continue to coat with glaze and rotate the skewers while they cook to make sure they cook evenly and get drenched with that delicious Polynesian sauce. That is it. 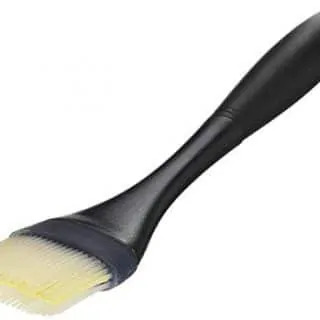 See, easy peasy! Now go ahead and sit down, grab a skewer or two, and enjoy. Yum! If you are looking for other ideas of what to serve at your barbeque, check out this easy caprese pasta salad or our tasty no mayo coleslaw recipe. 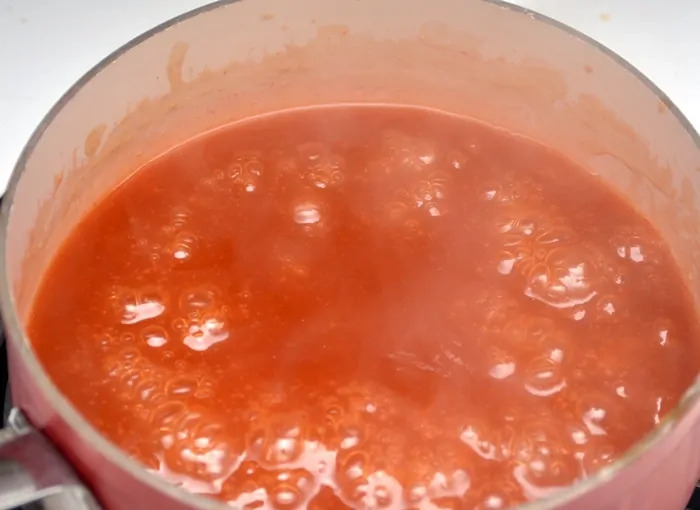 In a small saucepan, whisk together pineapple juice, water, ketchup, apple cider vinegar, cornstarch, soy sauce, and brown sugar until smooth and well combined. Heat over medium heat, stirring often, until the sauce thickens. Remove from heat and set aside to cool. While the sauce is cooling, prepare ingredients for the skewers. Cut chicken thighs into 2-3 in. cubes. Chop the onion and bell pepper into thick pieces that will easily slide onto the skewers without breaking. 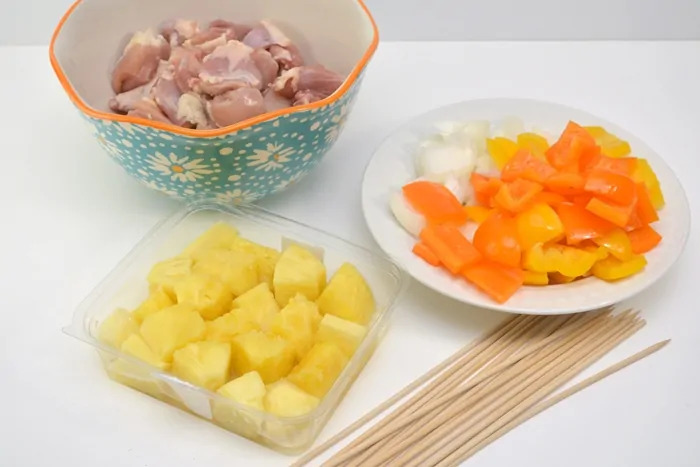 Assemble skewers by threading pieces of onion, peppers, chicken, and pineapple onto your skewers. Place skewers on grill over medium heat. Cook until the chicken is done in the center. Baste the skewers with the prepared Polynesian sauce on both sides as you turn them to cook all sides evenly. These are perfect for our next BBQ. Thanks for sharing. Our guests are going to love them. Nicely grilled! I’m going to try these with tempeh… that glaze sounds delicious! 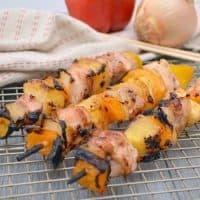 These are perfect for the labor day weekend and I love the sweetness of the pineapple and chicken together what a great combo! This grilled pineapple chicken recipe will be perfect for our next backyard gathering. What says outdoor party better than grilled pineapple and chicken. YUM! That glaze sounds fantastic! I love a good grilled kabob like this! I am vegetarian but love grilled pineapple. enjoy the last few days of the grilling season. 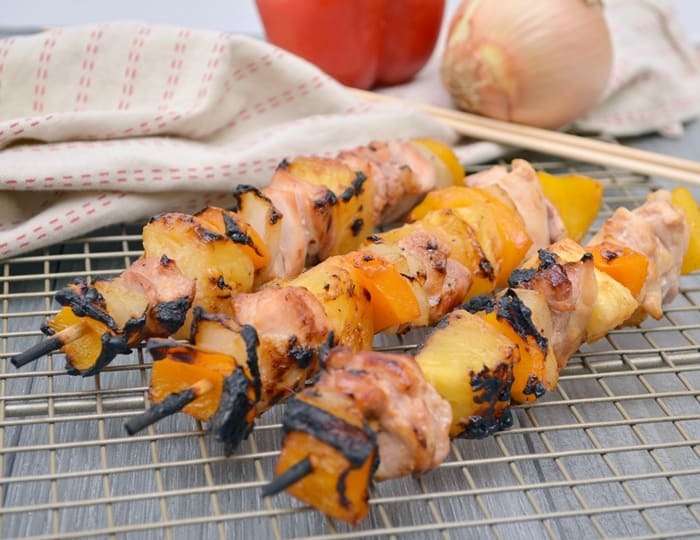 I love love love chicken on skewers because it can be so flavorful with the fruit and veggies nearby! Looks awesome. These look good. Havent done chicken skewers for a long time. Wil give these a go. Oh wow, lip-smacking good! I’d love to try this, and I”m thinking this sauce would be good to try on other things, too. Sounds something interesting to try. I love grilling skewers on the BBQ. I have never heard of Polynesian sauce before though, sounds tasty! That glaze! I love the sweet + spicy combo so I will definitely need to make this glaze. I love pineapple and chicken combos! This looks tasty! Love anything on a skewer! And so agree on the pineapple chicken combo! This has always been one of my favorite food combinations. The flavors are so tasty together! Especially when thrown on the grill. Saving this! Pineapple goes so well with chicken, they are a perfect combination. 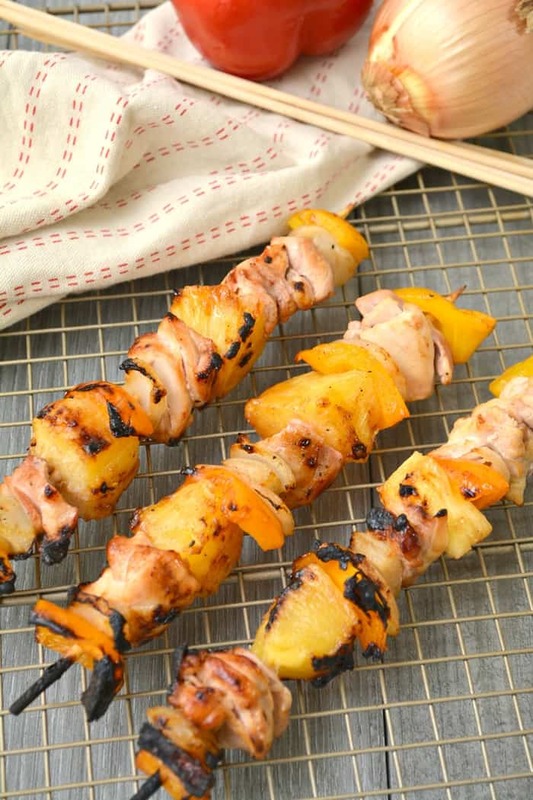 Ideal for skewers, as the pineapple is good and dense and less likely to fall off. A really tasty treat for the grill.